Local agricultural lender, MidAtlantic Farm Credit, announces the hiring of Rachael Vezzosi as a loan officer in their Shoemakersville, Pennsylvania office. I’m excited to be joining the Farm Credit family and look forward to working with our customers on a daily basis. 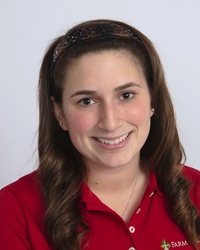 MidAtlantic Farm Credit recently announced the hiring of Rachael Vezzosi as a loan officer. She will be based in the association’s Shoemakersville, Pennsylvania office. Vezzosi will report directly to Bill Kitsch, area lending manager for MidAtlantic Farm Credit. Vezzosi graduated from Penn State University with a bachelor’s degree in agribusiness management. She was a member of the agricultural fraternity, Delta Theta Sigma. Originally from Milford, New Jersey, Vezzosi is a member of Alexandria (NJ) Equestrian Association.